PDB-101 is "Best of the Web"
On November 18-19, 2016, the Human Frontier Science Program Organization (HFSPO) hosted a meeting of senior managers of key data resources (including members of the Worldwide Protein Data Bank) and leaders of several major funding organizations to discuss the challenges associated with sustaining biological and biomedical (i.e., life sciences) data resources and associated infrastructure. A strong consensus emerged from the group that core data resources for the life sciences should be supported through a coordinated international effort(s) that better ensure long-term sustainability and that appropriately align funding with scientific impact. Ideally, funding for such data resources should allow for access at no charge, as is presently the usual (and preferred) mechanism. David Goodsell's painting of the Zika Virus, created for the Molecule of the Month feature on Zika Virus, was recognized as one of the best science images of the year. 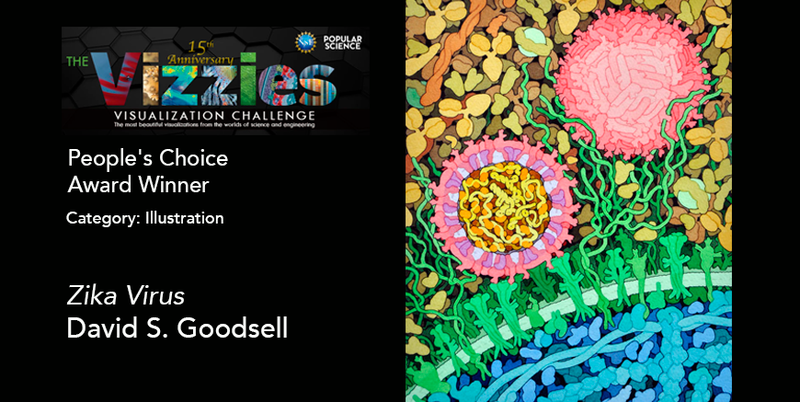 Popular Science magazine and the National Science Foundation (NSF) recently announced the 10 winners of the 15th Annual Vizzies Challenge, celebrating the use of visual media to artfully and clearly communicate scientific data and research. The competition recognizes the best photographs, videos, illustrations, interactive apps, and posters and graphics produced by academic researchers, artists or hobbyists. A team of experts at NSF and Popular Science pared hundreds of submissions down to 50 finalists; from those 50, a panel of outside experts picked five Expert’s Choice winners. Popular Science readers chose five People’s Choice winners. David’s image of Zika was selected as the People's Choice in illustration. For more, visit the Vizzies awards site and the Molecule of the Month on Zika Virus.